This product carries 2 items: leg element and medic/utility pouch made of Nylon 1000D and ventilated mesh. Unique design assures you with high comfort and stability, to keep your gear and action safe. Ventilated mesh leg element attached to the leg with two 1.5" width adjustable straps to fit every size. The leg element has a shadow zipped pocket for mini IV Line kit and Chest seal. The mesh board has 3 MOLLE lines to attach the medic kit or other pouches, and a swivel buckle. Medic/utility pouch with elastic outer pocket for disposable gloves and securing D Ring. Inner organizer with elastic secured strings for your medical and personal equipment. Back elastic pocket for scissors/multitool/pen. 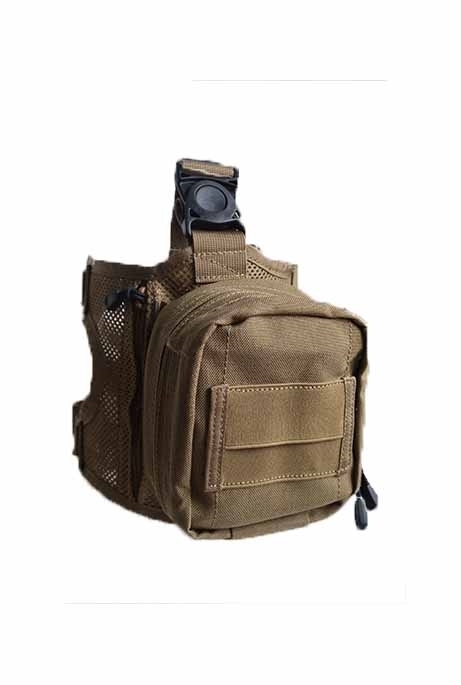 This pouch can be attached to any MOLLE panels on your vest or belt.